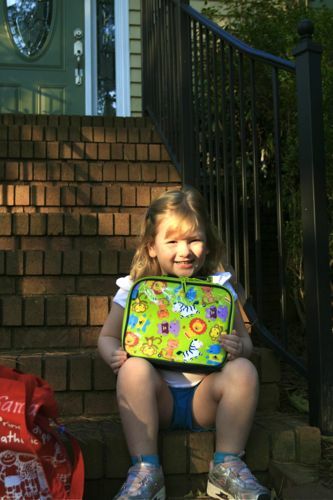 To say that Samantha is excited about school is an understatement. She started at “big girl” school today. She was eager to get out of the car during carpool and had to be prompted to turn around and wave goodbye to me. It’s a good thing I got my hug and kiss before then! When I picked her up, she told me the things she did today. Learned how to sit criss-cross applesauce. Read a book about a panda. Learned how to raise your hand. Colored with crayons (but not paint or pencils). Played on the playground (slide, but not swings). Her lunch was mostly eaten, and I was left to clean up that used-to-be-shiny-just-hours-before lunch box. I just read today about a few lunch box ideas so we won’t get in a PB&J rut. I haven’t fully checked them out yet, but maybe they will help: ThisLunchRox and Wendolonia. Wow! No more brown baby AND big girl school! She is so grown up! Glad she is enjoying it.